The VTech VCS704 is a conference phone designed for small and medium sized businesses that is compatible with your existing phone systems. The system is designed to resist interference from mobile phones and other mobile devices and delivers crystal clear audio conferencing by eliminating conference table clutter. The system ships with 2 fixed microphones and 4 DECT 6.0 wireless microphones with Orbitlink Wireless Technology™. The VTech VCS704-R has many exciting features for users of all types. 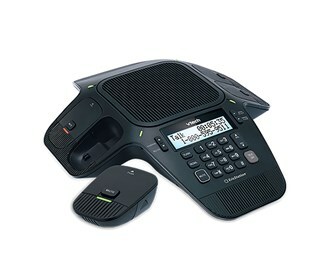 See the VTech VCS704-R gallery images above for more product views. Feel safe about your purchase of a Factory Serviced VTech VCS704-R, knowing its been fully tested by FactoryOutletStore.